Crash Bandicoot's appearance on a Sony Facebook profile seems to suggests an upcoming sequel, but it probably doesn't. Last month, Activision abruptly removed any mention of Crash Bandicoot from its website, which provoked an avalanche of speculation about the marsupial's future plans. Many hypothesized that Sony may have regained the exclusive rights to the franchise, but Activision quickly quashed this idea. Last week, however, Sony's Denmark Facebook page teased an image that is stirring up even more Bandicoot rumors. The image seems innocuous at first. 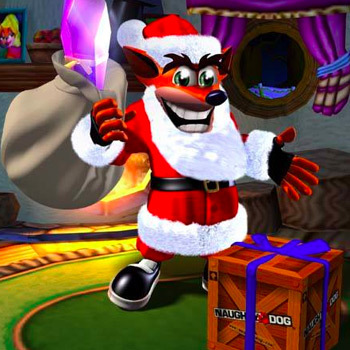 Mr. Bandicoot is dolled up in a Santa Clause costume with a bag of gifts slung over his shoulder, and Sony's post asks "What do you hope is under your Christmas tree this year?" Obviously Sony is leaning hard on innuendo here. The most interesting part about this image, though, is the inclusion of Naughty Dog's logo. The folks at Naughty Dog stopped developing Crash Bandicoot titles in 1999 when Jak and Daxter took off, and recently they've been working on franchises like Uncharted and The Last of Us. So, it seemed a little strange that Naughty Dog would revisit Crash Bandicoot nearly 15 years after stepping aside--especially when you consider that Naughty Dog only produces about one title per year, and we already know that an Uncharted sequel is in the works. Unfortunately, after doing a bit of digging, it has become clear that Sony is just being playful. This image is part of a series of production stills that Naughty Dog created in 2000, so it probably doesn't point to an upcoming sequel. And, it certainly doesn't suggest any involvement on Naughty Dog's part. I'm very sorry if I just ruined Christmas.